I just went downstairs for a quick break, and grabbed today's NYTimes food section. I nearly fainted from orgasmic shock. THE POPULAR VOTE At the Machine Shed near Des Moines, from left, a sticky bun, cinnamon roll and a fruit-filled wagon wheel. I have to say that while the online picture is much sharper (the whole story is here: http://www.nytimes.com/2004/10/27/dinin ... oref=login) it cannot match the effect in full newspaper mode. I am shortly off to Reuters, I know it is not even close, but it's close enough. When my father and I made our annual pilgrimage to Montana to flyfish, we would stop at the I.M.S., in Urbandale. This was done for the "circuses" alone, really, as my father was a farm boy, and we ate much better renditions of the same foodstuffs around farm tables across northwestern Illinois-- most notably my grandmother's farm table. I pray that I am not reduced to introducing my children to traditional MidWestern foodways via the I.M.S. and its ilk. There is a Machine Shed between Milwaukee and Madison, plus another one of the brethern called Power Plant. I know we pass one on I-80 as we go east to New Jersey. Erik wrote: I pray that I am not reduced to introducing my children to traditional MidWestern foodways via the I.M.S. and its ilk. Erik as long as you are living and breathing, any child of yours will learn from you about midwestern foodways. Cook it and they will eat, I guarantee it. At the end of my long post on a trip to Central Kansas last summer I gave my tepid reaction to lunch at an Iowa Machine Shed. We didn't have any gooey desserts, though. The final meal on the trip was lunch at the Iowa Machine Shed in Davenport IA. We planned to stop somewhere in the Quad Cities. It was time for lunch, and this restaurant was very close to the gas station where we filled up. It is as kitschy as Cracker Barrel but uses mostly farm equipment. Water and iced tea are served in canning jars. Light level at lunch was much higher than Cracker Barrel. My wife had a good fried catfish sandwich plus thick beef-vegetable soup. Still with wishful thinking, I tried their version of pork tenderloin sandwich, which the menu says is their best seller. The batter coating that worked so well on the catfish was all wrong on the pork, which was the flaked and formed stuff to boot. I believe there is one in Rockford. I've eaten at them a couple of times and will say they are a reasonable choice when traveling. Lots better than Cracker Barrel and other chain options. The portions are huge though. The sticky buns and cinamon rolls are quite good. Not near as good as my grandmother or aunt made me as a child, but I would eat one now and then. Bruce wrote: I believe there is one in Rockford. Thank you for reminding me of one of the saddest meals of my life, Bruce. It is actually an "Illinois Machine Shed," but there may indeed be some affiliation. Two years ago, I asked my grandmother if I could take her out to supper on her Birthday. Being situated on a small farm, thirty minutes from Rockford, she proposed that we drive to Rockford so that we could do something "special" to recognize the occasion. When the day arrived, I picked her up and asked her where we were headed. "Just drive," she said. "Let it be a surprise." After navigating our way through what were, essentially, the outskirts of Rockford, we finally pulled up at the Illinois Machine Shed. Of course I was confused as much as anything, but I kept my mouth shut. ...after supper, when I gently chided, "Gram, why did we come all of this way, for things that you can make, right at home?" To which she responded, "I am getting too old to put on a full supper, and I wanted you to have a whole meal, with plenty to choose from, and as much of it as you care to eat." Last edited by Erik M. on October 27th, 2004, 10:02 pm, edited 2 times in total. I remember going to the Iowa Machine Shed outside Bettendorf. It was a favorite of my clients at Alcoa, and you know, as I recall the smoked pork chop was not bad -- plus, I believe the drinks were served in Mason Jars. Hoo hah! Pigs at a trough. Yessiree! Last edited by David Hammond on October 27th, 2004, 9:47 pm, edited 1 time in total. Sure, one should not base their culinary opinions just on pictures, but I have a hard jibing some of the comments on Machine Shed with what I see. Those pastries look really good, and I do not mean really good in the good picture sense. The cake looks heavy and moist in a way that only real ingredients could afford. And the frosting and whipped cream, looks awfully fine too. It looks so far from Cinna-bun. Maybe they got Machine Shed on a good day? It could also be the Red Lobster phenomena: small town with few choices, which by comparison Machine Shed looks pretty darn good. For those of us living in urban areas with plenty of choice and opportunities for discernment; Machine Shed doesn't hold a candle to our experiences. We had friends that lived on a farm in Davenport that we visited 3-4 times a year for about 5 years. They were trying to parse Iowa, and we had a lot of good barbecues at their farm, and learned about what markets you could find good things at, and tried a lot of restaurants. Iowa Machine Shop was one we tried early on, on the recommendation of other Davenporters. NOT. Maybe a nice enough place to take your grandma, but otherwise not worth the time or money.. Thanks to this article, this morning I stopped off at an O&H after a morning meeting in Racine. I brought a pecan kringle back to the office where my colleagues inhaled it in less than 10-minutes. Quite tasty indeed. I ate at the Machine Shed once, several years ago, and agree that it was mediocre. There aren't tons of great choices in the Quad Cities, but there are definitely better ones than IMS. I have eaten at Rockford and Bettendorf. They do some interesting recipes with pork. And the food was good. However, since it is a chain and not overpriced or in the city of cChicago, it must be bad. If you're headed west out of DesMoines on I80 and can wait an hour or so, try the Danish Inn Restaurant in Elkhorn. Frikadellar, morbrod, medisterpolse and 1,000 calories of havarti for desert. I never got to the regular deserts because everything else was very good (and lots of it). I know that it is a little early, VI, but, here you go. The Machine Shed is part of a small regional chain that includes food and lodging places. I have been to the original and to the one in Rockford, both ok for a hearty meal especially if you like pork. I have also been to Johnny's Italian Steakhouse in Peoria which is also part of this chain. The food was ok but quite expensive. Erik M. wrote: I know that it is a little early, VI, but, here you go. Ok, so I am currently in Appleton, WI. My hotel is right across the street from a Machine Shed restaurant so I had to check it out. I apologize for the picture quality, but I only had my cell phone with me. Comparisons to Cracker Barrel are justified, as the kitsch assault is pretty overwhelming. After ordering, you are served a plate of cottage cheese and coleslaw. The slaw was very bland, but surprisingly light on the mayo. The cottage cheese was very creamy, but also bland. My hostess recommended the roasted stuffed Iowa chop. For my side, I opted for the garlic mashed potatoes. The pork chop was pink from the smoker, and it had a definite smoky flavor. I also found the chopt to be pretty juicy; definitely a good choice. On the other hand, the garlic potatoes, while made from scratch, had very little garlic flavor and could have used more salt and butter. The green beans were equally flavorless. 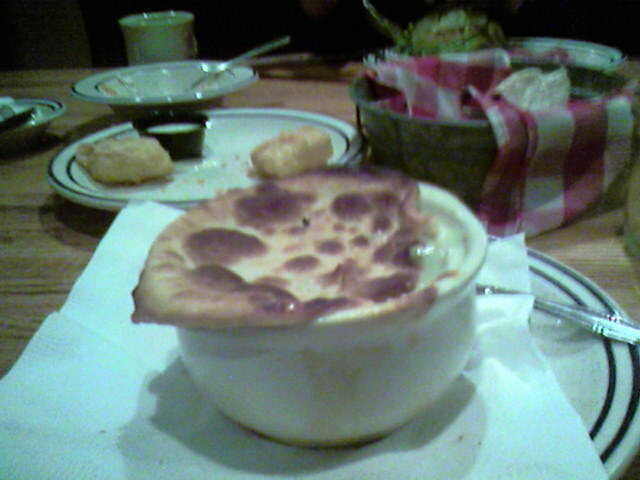 For dessert, I had their "famous" apple dumpling. It was decent enough, but the outside wasn't crispy at all. The apple inside was cooked perfectly though. All in all, a pretty average meal. Peas and carrots and potatoes were all cooked perfectly, and tasted like the vegetables they were shorn from. Chicken breast was moist, springy and also perfectly cooked. Gravy was light, not gloopy, not too salty. Crust was kind of a cross between pie crust and puff pastry. We took a whole apple pie home and it did not last long. It was the best pie I'd had in a while, firm apples, not too sweet, not overly spiced, not too gooey inside. Crust on top was crisp, with carmelized sugar crystals present. Bottom was a bit soggy, but probably to be expected on a (at least--by the time we ate it) day old pie. Service was a bit harried, but efficient and friendly. The place was absolutely packed and we had to wait about 40 minutes for a booth. The decor, well, I'd put up with it again for that food. Anyway, the real reason I'm posting is this: When we walked out, there was a strong smell of cow manure outside the front door. Didn't notice it when we walked in. Now, having grown up in farm county, MI, I happen to like the smell of cow manure. But, it seemed out of place in sub-freezing February, even in Iowa. Do they pump that smell in? Er, out? My last visit to the Machine Shed was 18 years ago. At the time I thought the food was marginal at best. This past weekend I had friends suggest that we visit the MS in Rockford. My hopes weren't very high. Either things have changed ALOT in 18 years, or my memories of what I ate 18 years ago are not very clear. This time around I thought that they served outstanding comfort food. It reminded me of church fund raising suppers from long ago. I had the Shepherd's Pie, which was a tasty tender pot roast covered in veggies and mashed potatoes. My friends had the Iowa stuffed pork chop (HUGE) and the stuffed pork loin. They all were happy. I thought the "fixins" (cottage cheese, coleslaw, green beans, and bread basket...which included excellent banana bread) were good bonus additions to the meal. If your looking for comfort food with an old fashioned taste, this is the place for you! Our Machine Shed meal in Davenport was much better than the meal that we had at the location in Lake Elmo, Minnesota. We ordered the Stuffed Iowa Chop (excellent), the Pot Roast (good as well), and Mac & Cheese (thumbs down -- grainy and tasted bad). I hardly see restaurants posting their recipes online. I was quite surprised. great job at doing what they do.